Some of you may not have encountered the Emit punching system, as both Canada and the US use SportIdent as well as most of central Europe. The two countries you are likely to encounter this system are Norway and Finland. This system consists of an emit "brick" attached to your hand, and an emit station into which you must place the brick in a particular orientation. The reason for this specific orientation (and a notable difference between Emit and SI) is that the brick has a paper backup. 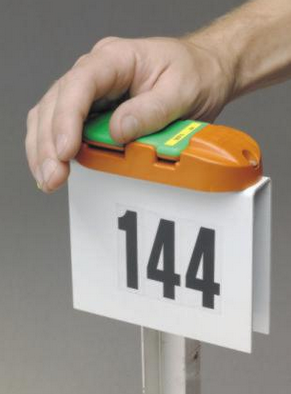 A special piece of paper is slid into the brick that will get pricked by a pin in a particular spot for each station, and serve as a backup if no electronic punch is registered (Note: it is often best to tape down the edge of the backup paper so it does not fall out as easily). Many that first encounter this system (particularly after being familiar with SI) find it hard to get the brick in at the right orientation and therefore fumble around and punch slowly. So, here is an attempt to show how it can be used. 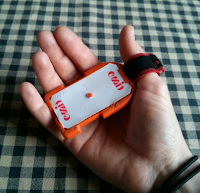 I attach my brick to my thumb, which allows me to grasp it with my other fingers. Alternatively, Thomas attaches the brick to his ring finger, which allows him to grasp it with his fingers and thumb. 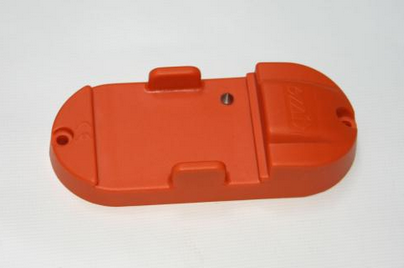 Both of these allow you to use your dexterity to somewhat rotate the brick within your hand. Then, as you approach the control you must look at the station to see its orientation and adjust your and/or the brick's orientation to punch. For instance, it may be best for you to to be on the right of the unit and reach across yourself for one orientation (assuming you are holding the brick in your right hand), or on the left of the unit and keep your hand on that side for the opposite orientation. 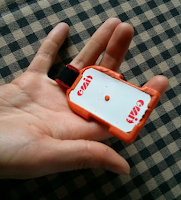 In addition to the physical punching systems, both Emit and SI have a touch free version. The touch free SI (touchless Air) looks like a normal SI stick, but does not have to be placed inside the unit to register a punch. 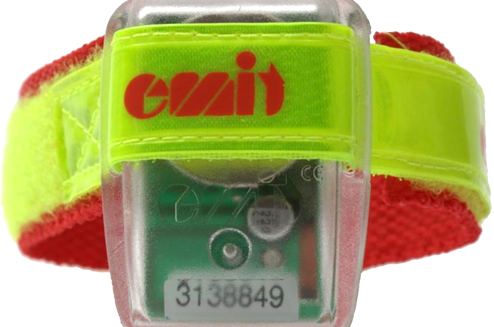 The Emit touch free is an strap with a unit on it (usually worn on the wrist) that can be passed near the station. 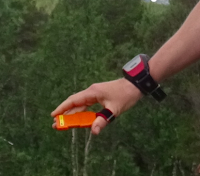 At the recent World cup in Norway and Sweden the Emit touch free system was used in the sprint relay in Norway and the touchless SI was used in the sprint in Sweden. Unfortunately, a few of the units in the Sweden sprint were programmed in the wrong mode so many athletes experienced very slow punching at those controls. The results of the sprint were thrown out as some athletes had to go back after running past the controls, and others did not register punches at all. There has been more experience using the touch free emit as it has been used in ski-O for several years now.